Finally we arrive at the end of our journey through the cosmos, and what a journey it has been…………. I have watched your frustrations, and your joy. I have been so proud of what all of you, especially the beginners, have achieved. It has given me the greatest pleasure to enable you to learn something new, even some of you that have been crocheting for many years. And there is still something new, even at the end. Slanting Clusters are a fabulous stitch that I designed for this crochet a-long, and I know I will use them in future designs, but for now they are the final burst of star dust shooting out into the eternal universe. Finally, as you reach the end of part 9, I recommend blocking to give a beautiful polished look to your blanket. You can find lots of information on blocking HERE. Should you want to make your Cosmic even larger you can easily repeat parts 8 and 9, just leave the final round of crab stitch until you are ready to finish the edge. ♥ I would like to thank all of you for joining me on this journey. ♥ The pattern will remain free, and will be available on the Stylecraft website, for UK, US and Dutch terms. All other translations remain here on my website. ♥ You will always receive help if you are a member of my Facebook group Helen’s Hookaholics, or you can contact me through the contact page at the top of my website, or on Ravelry. ♥ Please note questions in comments are not always answered swiftly. 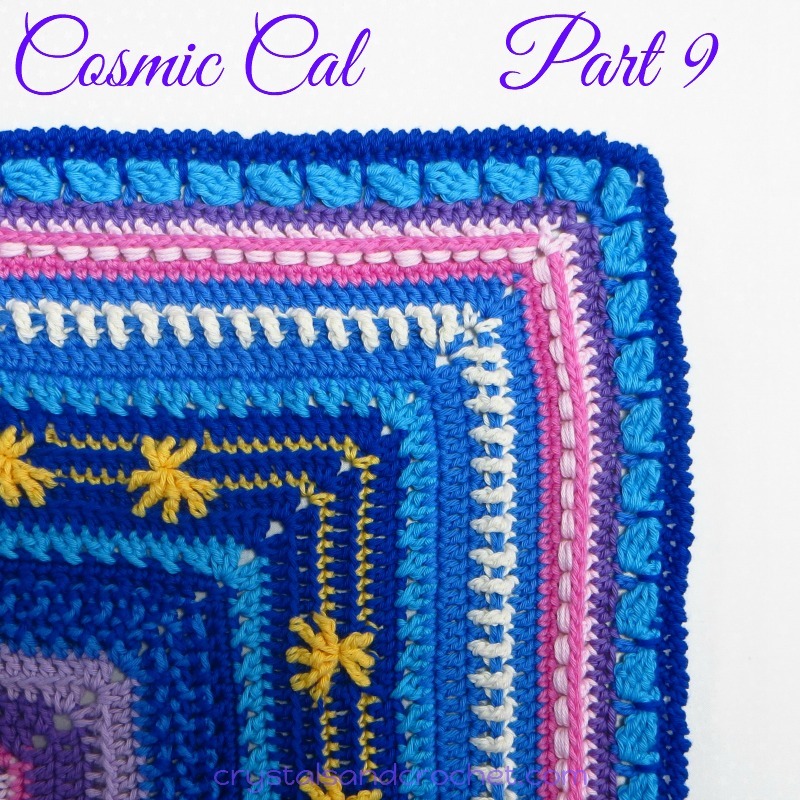 Part 9 of the Cosmic Cal, sponsored by Stylecraft Yarns. I’ve just finished – yeah! Boy have I enjoyed this. Beautiful colours and great stitches to get your teeth into. I thought the crab stitch border was gorgeous and just perfect. Thank you so much. Thank you for a beautiful pattern. You are a real inspiration for me and I love your work.